Some people will do anything to avoid filing for bankruptcy. They might meet with a credit counselor and try to develop a budget. They might unplug their phone and hide under the covers. Another option debtors consider is debt settlement. 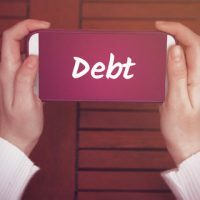 At our firm, we have had clients file for bankruptcy after failing to settle their debt, so we know something about the down sides to this approach. In our opinion, debt settlement is rarely preferable to filing for bankruptcy. Collecting on a debt takes time and money. Even if a creditor wins a lawsuit, they can only collect the money they are owed if the debtor has sufficient funds. In many cases, creditors never receive 100% of what they are owed, and, if they bring an expensive lawsuit, they might end up further behind. This is the reality of debt collection. And it creates an incentive for some creditors to accept less than 100% of what they are owed in exchange for releasing the debtor from the unpaid remainder. This is called debt settlement. Debtors who take the settlement approach try to save up a lump sum of money that they can offer a creditor. Almost always, this means they will stop making payments on their debt. After all, if they could pay their debts and save money at the same time, they wouldn’t be in financial trouble. So the only way to save up a lump of money is to basically go into default. What’s Wrong with Debt Settlement? Almost everything. Let’s start with the fact that no creditor is required agree to accept your offer. They can still go into court and sue you for 100% of what they are owed. As a result, it is incredibly risky to just stop making payments, which leaves you exposed to a potential lawsuit. Second, as you stop making payments, your credit is shredded. Every missed payment will get reported to the credit reporting agencies. Now, a bankruptcy will also cause your credit score to tank, but that’s kind of our point—there is no benefit to debt settlement. Your score will fall in the toilet either way. Third, debt settlement can be very stressful. Guess what is happening during the months where you are trying to build a lump sum? Your creditors are calling you constantly. They might even show up at your home. With a bankruptcy, by contrast, the automatic stay prevents all creditors from trying to collect on a loan as the bankruptcy process works its way through the court. Also, negotiating with a creditor can be stressful, so some debtors hire firms to negotiate for them. Of course, the firm charges their clients for the privilege of using their services. This often leaves consumers further in debt. In short, you don’t gain anything from debt settlement that you wouldn’t gain from a bankruptcy. Bankruptcy is faster, less expensive, and less stressful. True, your credit score will fall, but it will fall with debt settlement, also. For more information about your options, please contact Nowack & Olson today. One of our South Florida bankruptcy attorneys will meet with you for a free consultation, so please call 888-813-4737 to schedule yours.